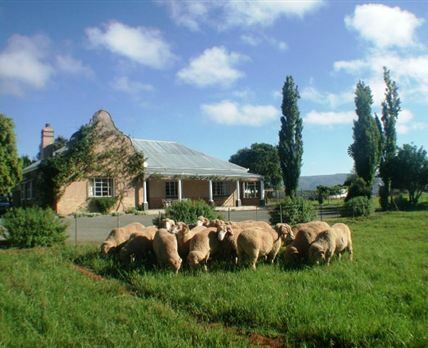 Wellwood Farm – Trymore Cottage is located on 10 000 arid hectares of hill, on one of the Karoo’s finest and most historic farms. 30 km north of Graaff Reinet, five generations of the Rubidge family have built up a renowned merino stud and an oasis of legendary hospitality. The farm is a wonderful place to stay, ideally situated for an overnight stop between the coast and the inland. This is no place to be in a hurry and the comfort and beauty of Wellwood make it a perfect retreat where you can unwind. Explore and experience the tranquility of this vast landscape, the clarity of the air, the brilliance of the stars, and the unique contentment of Karoo life. Marion and Robert Rubidge make guests thoroughly welcome at Trymore Cottage, which lies about 1 km from the main homestead. The cottage features a solid country charm of its own and all the space and comfort of an owner-built house to be lived in and enjoyed as a home. Trymore is only let to one party at a time, and its four double bedrooms and two bathrooms make it ideal for a family or group bookings. Although Trymore Cottage has a fully equipped kitchen well suited for the self-caterer, there is nothing better than a traditional farm dinner. Enjoy Karoo lamb or venison pie which may be ordered when you make your booking. Look forward to lavish farm breakfasts with freshly laid eggs and farm-fresh orange juice, prepared and served in the dining room at Trymore. After dinner is the perfect time to sample that kumquat liqueur on the patio, listening to the crickets and gazing at the unequalled brilliance of the stars. Click here to enquire at Wellwood Farm – Trymore Cottage.